We are really looking forward to being one of the hosts for this year’s Arts Trail. 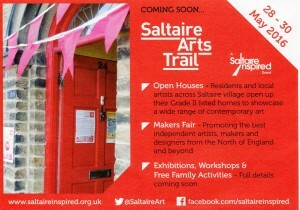 Saltaire Arts Trail is a community arts event held annually on the late May Bank Holiday weekend. ‘It offers an imaginative visual arts programme, celebrating the village’s rich heritage, and offering opportunities to both emerging and established artists‘. We are delighted to be hosting the work of four artists - Sandy Dorer, Clare Holdstock, Mack Mathod and Jo Lee. Please come and visit – we are open from 10.00am to 5.00pm Sat 28, Sun 29 and Mon 30. We are also open as a preview evening on Fri 27 from 6.00pm to 8.00pm. For a full programme of events and artists check out the website. 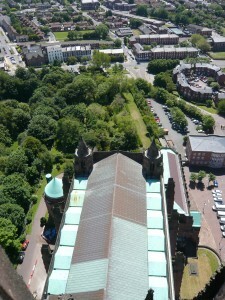 The copper roof at Liverpool Cathedral is reaching the end of its life and is being replaced in phases. The re-roofing of the Lady Chapel and part of the Nave roof has been funded by the Cathedral’s Fabric Commission WWI Cathedrals’ Fund. 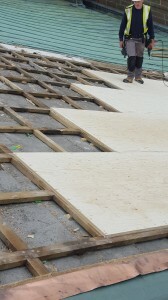 Due to its exposed location, the existing roofs were suffering from wind uplift allowing water to penetrate to the substrate beneath. The copper replacement roof project currently in progress takes account of the wind loading with extra fixings and careful seam detailing. Also, one of the benefits our site inspections is the amazing view. Work has started on site to repair the State Gate at Bradford Cathedral. Built in the late 1880s, the State Gate houses an open processional staircase within an imposing and elaborate stone vaulted structure in a gothic revivalist style. The State Gate forms an important gateway into the Cathedral grounds from the city centre but has suffered from a number of issues including water penetration seeping into the structure making it unstable, along with mould and algae growth on the walls and floors. Repair works include the cleaning and repointing of all stonework, the stabilisation of the vaulted structures, the lifting and re-bedding of large stone steps and a new drainage system to re-direct water away from the retaining walls. 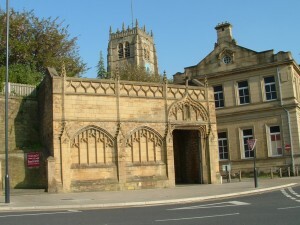 The project is funded by the World War I Cathedrals Centenary Repair Fund and will be completed in late 2015 in time to coincide with the opening of the new Westfield shopping centre directly opposite. 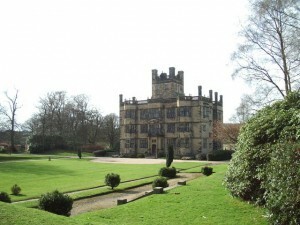 Work has started on site at our project at Gawthorpe Hall in Lancashire. The works comprise repairs to the south and west elevations including stone repairs, repointing and window repairs. Internally, specialist plasterwork repairs will be carried out to ornate ceilings. Gawthorpe Hall is a grade I listed Elizabethan country house in extensive grounds on the banks of the River Calder in Padiham, near Burnley in Lancashire. It is owned by the National Trust and has been run in partnership with Lancashire County Council since 1972. The House, thought to be built in 1600-1605 is attributed to the Elizabethan Architect Robert Smythson, whose other notable buildings include Hardwick Hall in Derbyshire. The house along with its immediate grounds was remodelled in the 1850s by Sir Charles Barry, designer of the Houses of Parliament. Although it is closed until March 2016 whilst the repair works are carried out, it is a museum open to the public and includes textile and costume collections provided by the Shuttleworth family – the original owners of the Hall. The Hall also houses the North West’s largest collection of portraits on loan from the National Portrait Gallery and is the final stop on ‘The Brontë Way’, a long distance route with strong associations with the writings of Charlotte Brontë and the family. We will keep you updated with progress as there are several interesting conservation repair challenges.